Üsküdar Çevresi: Quotation: Princeton University A World History of The World, "Newspapers and Goverment"
Quotation: Princeton University A World History of The World, "Newspapers and Goverment"
Forum Question: What role did newspapers play in the relationship between government and people? In what ways was the press used to aid or oppose conflicts? The rise of newspapers redefined the relationship between people and their government as they not only reported news but also spread ideas, increased public awareness, and influenced political proceedings. The chief purpose of newspaper reporting is to inform the public. Prior to the newspaper’s rise, people learned of world events by word of mouth, usually disseminating from and supporting the agenda of the government. The newspaper however, directly provided people with details concerning governmental and world affairs, thus freeing them from a reliance on the government to learn of world affairs. Indeed, this independent, seemingly unbiased source of news completely circumvented the government, subjugating their control on the spread of information. Newspapers also helped to spread ideas further and faster. People no longer had to live in cities to learn about “alternative visions for the 19th century.” With the newspaper’s help, they could read about utopian socialism or Marxism whilst in the countryside, allowing the propagation of revolutionary ideals outside of urban centers as well. Thus, newspapers directly informed the public, spread ideas, influenced government proceedings, and mediated the relationship between a government and its people. In what ways was the press used to aid or oppose conflicts? As mentioned above, newspapers framed the public debate and as their influence grew, they swayed public opinion in support or opposition of government endeavors through the combined use of word and image. 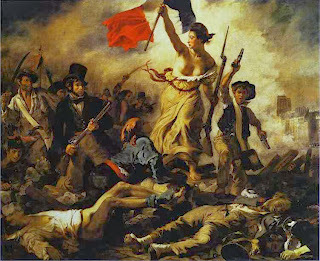 Newspapers played a large role in the Revolution of 1830 by demonstrating their power and influence—the power to help start revolutions and oust rulers. Charles X made an enemy of the press when he suspended the “liberty of the periodical press” in response to his ministers’ pleas. These decrees however, sparked the Revolution of 1830, or the July Revolution, that ended the reign of Charles X and the House of Bourbon, as reporters and editors from various newspapers joined together in protest and continued to publish. To Charles X’s dismay, “Mangin, the prefect of police, tried in vain to arrest these editors. He made an attempt to enforce the ordinance against the press and also to close the cabinets de lecture where many Parisians read the newspapers.”  These reporters and editors successfully used their newspapers to encourage others to resist Charles X and to join the revolutionary cause. In contrast, other newspapers helped to create a sense of national identity in support of government policies. For example, John Tenniel’s cartoon, entitled “Justice,” for Punch Magazine helped to boost morale and create a national identity throughout England. 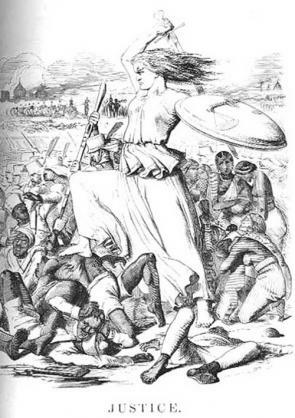 The cartoon depicts Britannia, carrying the scales of Justice on her shield, crushing the Sepoy Rebellion of 1857. Obviously, this picture is not a realistic depiction of events. Rather, Tenniel seems to be using imperial images to boost national moral and patriotism. Newspapers used images and words to both inform and shape public opinion as they changed the dynamic in the relationship between the government and the people.